The fictional events of the BattleTech universe constitute a "future history" that describes the course of humanity from modern times until the mid thirty-second century. It can also be considered an alternate history distinct from our own, since its point of divergence from the real world occurs in the past; this is not the focus of the series, though, and is more the result of real-world history overtaking the early years of the BattleTech timeline. Given its central theme of military conflict, the events of the BattleTech universe can be classed as a military history, albeit a fictional one. Incessant wars are the backdrop of most BattleTech stories and historical happenings, the majority of which concern individuals in the military rather than civilian sectors. Equally important to BattleTech history are politics and technology. Some sections of this article contain real-world annotations. These are noted by indented italics. The earliest events distinct to the BattleTech universe occur after the end of the Cold War and the collapse of the Soviet Union. The United States, Europe and Japan announced in 1994 their intention to jointly construct an orbiting industrial facility named Crippen Station, which was successfully launched eleven years later. A 1997 coup d'état by hard-line communists restored a militant, Soviet-style government in Russia and sparked a "Second Cold War" with NATO that lasted until the start of peaceful reforms under premier Oleg Tikonov in 2005. The republic crumbled in 2011, igniting a civil war that drew in NATO and saw the successful use of the Western Orbital Defense Network (WODeN), successor to the earlier Strategic Defense Initiative, to intercept a preemptive Russian missile attack against western targets. The war ended with a Western Alliance victory in 2014. Beginning with the establishment of the Alliance Space Command in 2016, humanity began moving out into the solar system. The first lunar settlement was established in December 2016, and the first manned mission to Mars launched the following year. The advent of fusion power in 2020 led to the first fusion-powered interplanetary spacecraft, the AS Columbia, which launched from Crippen Station on October 12, 2027. Colonies were soon established on Mars and the Moon, and automated probes launched to neighboring star systems which returned evidence by 2050 of nearby habitable worlds. By the beginning of the twenty-second century the Western Alliance had grown to become the Terran Alliance, and despite discontent from some of its poorer constituents pursued an agenda of rapid technological development. Faster-than-light travel, the theories of which were first postulated by Thomas Kearny and Takayoshi Fuchida in the early 21st century, were realized on September 3, 2107 with the successful voyage of the first FTL spacecraft, the TAS Pathfinder, which made a 12-light year jump to the Tau Ceti star system. Beginning with the establishment of the first extra-solar colony on New Earth (Tau Ceti IV) in 2116, a wave of colonization began that continued for centuries. By 2235, some 600 colonies had been established within 120 light years of Earth, but the difficulties maintaining authority over such far-flung worlds sparked the first rebellion against the Terran Alliance. Known as the "Outer Reaches Rebellion" and led by the colony world of Denebola, it precipitated the downfall of the Alliance Parliament's Expansionist Party and swept the Liberal Party into power. The Liberals announced that the Alliance would withdraw to a thirty light-year radius (or two-jump) sphere surrounding Earth, thus granting the outer colonies independence. Numerous small kingdoms rapidly formed, most of which quickly conquered or merged with their neighbors leaving a handful of larger nations. Political corruption and instability, and the economic strain of supporting its colonies, eroded support for the Terran Alliance, and in 2314 it descended into civil war. The Alliance Global Militia under the direction of Navy Admiral James McKenna imposed an end to the conflict in 2315, dissolved the Parliament, and established in its place the Terran Hegemony, with McKenna elected as its first Director-General the following year. During McKenna's 23-year tenure the Hegemony sought to reassert its authority over the outer colonies, but though achieving some early successes the effort was ultimately a failure and galvanized resistance to the Hegemony; McKenna's successor, cousin Michael Cameron, concentrated on establishing more peaceful international relations. One of Cameron's most lasting legacies was a system of aristocratic rule, originally based on individual achievement but later conferred by heredity, which he introduced in 2351. The ranks of nobility created by his Peer List led to the formation of numerous feudal ruling families and was the foundation of many of the Great Houses of later centuries. The fledgling nations that earlier had fought to resist Hegemony aggression began in the mid-twenty-fourth century to turn against each other. A territorial dispute between the Capellan Confederation and the Free Worlds League in 2398 escalated into open hostilities (the First Andurien War), which in turn prompted "land grabs" and efforts at territorial expansion by the surrounding states. By the end of the century the "Age of War" had begun in earnest and violent combat raged between the forces of nearly all the major nations, including the Hegemony and states in the Periphery. The near-annihilation of the population of the Capellan world of Tintavel in 2412 exemplified the vicious excesses of the age, and led later that year to the adoption by all the major nations of the Ares Conventions. The conventions imposed strict prohibitions on how and where war could be waged and what constituted legitimate targets, discouraged orbital bombardment, and also outlawed the use of most nuclear and biological weapons. However, though intended to limit civilian casualties and prevent atrocities like those on Tintavel, the conventions also inadvertently institutionalized war as a means of settling disputes and ushered in an era of near-constant warfare. Emerging from the new military restrictions set by the Ares Conventions, large robotic war machines known as BattleMechs were developed by the Terran Hegemony in 2439 and first used in combat against the Draconis Combine in 2443. 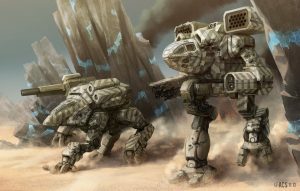 Both powerful and intimidating, BattleMechs drew attention away from space combat and onto the ground, and remained the most high-profile military units throughout all subsequent BattleTech history. The design secrets of the BattleMech were stolen during a raid by Lyran Commonwealth commandos on a Terran 'Mech factory and subsequently spread by trade and conquest to all the other Great Houses. With the major combatants exhausted, the Age of War wound down in the mid-twenty-sixth century. Near the ending of the Age of War, Ian Cameron led the formation of the Star League with help of the Free Worlds League and the Capellan Confederation. Then after the two supporting states, the future Star League gained the willing support of the Houses, Ian Cameron formed the Star League. The formation of the Star League in 2571 led almost immediately into The Reunification War. The attempt to force the periphery states into the League lasted for twenty long years. This fighting would impact the history of those realms for the next several hundred years. In the mid 28th century the current First Lord of the Star League died suddenly and tragically in an accident; Richard Cameron, then still a boy and unready to rule, was thrust onto the throne. Commanding General Aleksandr Kerensky was appointed as regent of the Star League. The Star League Council, composed of the five Great House Lords, saw themselves as the true rulers of the Star League. Upon reaching maturity, the son of the deceased First Lord sent out edicts limiting the house armies, while also placing higher taxes on the Periphery states. This started the Border War, occupying much of the League forces with quelling civil unrest. Taking advantage of this unrest, Stefan Amaris (the leader of the Rim Worlds Republic) first became a personal friend of the First Lord, then Stefan Amaris killed all of the Cameron family—even the First Lord himself—and claimed the title. This was truly the beginning of the end for the Star League. The Amaris Coup touched off thirteen years of fighting as the Star League Defense Force fought its way from the Periphery to Terra. General Alexander Kerensky's effort to remove the usurper claimed nearly three quarters of the SLDF. Still suffering from recent battles and unable to hold back the Houses and the coming darkness, Kerensky began an exile of all willing troops to leave known space, thus leaving the way open for the Succession Wars. Following the defeat of the Amaris Coup, General Kerensky attempted to reestablish the Star League, but the council lords stripped him of his title of Protector of the Realm, both because they feared his power and they coveted the position as First Lord for themselves. The only thing the bickering council could agree upon was to charge Jerome Blake with restoring the HPG network that allowed the planets to communicate with their interstellar neighbors. Soon enough, each of the lords returned to their capitals and declared him or herself First Lord. They then began to wage war to see who was worthy of the position. Kerensky, seeing the battles between the Houses as only the beginning, left with approximately 80% of the Star League forces. The Terran Hegemony, ruled by House Cameron, was at the center of the Inner Sphere, ruling a rough sphere centered around Terra. Clockwise around that, there was House Kurita's Draconis Combine, House Davion's Federated Suns, House Liao's Capellan Confederation, House Marik's Free Worlds League, and House Steiner's Lyran Commonwealth. These nations may have remained fairly stable, but they were incessantly at each other's throats, seeking every advantage they could find on the fields of battle. The five of the great houses, excluding the Terran Hegemony, almost immediately embarked upon the greatest war in human history. Snatching up the ruler less planets formerly of the Terran Hegemony, and fighting each other for supremacy, the Inner Sphere devolved into the First Succession War. The fires of this war wreaked havoc on human civilization, and lowered the technology level of the Inner Sphere drastically with actions such as orbital bombardments, nuclear weapons, the destruction of JumpShips, factories, and killing scientists. Being the most brutal of the Succession Wars, the First War did the most to send humanity hurtling backwards technologically. Eventually, the First Succession War ended in an exhausted stalemate after 35 years of war, only to resume in the Second Succession War less than a decade later. The most notable event of this war was the Kentares Massacre, in which Combine forces killed almost all of the denizens of the Federated Suns' planet Kentares IV. This genocidal action demoralized the Combine's bushido-minded warriors and galvanized the Federated Suns' war effort that enabled them to push the invading Combine back to the border. The Second Succession War lasted another 34 years, further destroying the now-irreplaceable base of Star League technology, and resumed in the Third War a mere two years later. The Second Succession War had no distinct events beyond being of such a long period of destruction, almost making it unnoteworthy. The Third War lasted for over 150 more years, on and off. Because the Successor States no longer had the knowledge to produce or repair high-tech equipment that allowed them to communicate with and travel amongst the stars, the total war of the first two Succession Wars ended in an unspoken agreement that approximated a return to the Ares Conventions. No longer were JumpShips, automated factories, or water-purification plants destroyed. Instead, they were fought over in set-piece engagements and the losers simply consoled themselves with the hope that they would re-take the planet later. Moreover, large offensives were no longer the order of the day. The Successor States' militaries were depleted in every sense, so they switched to a pattern that was closer to raids than assaults. With whole generations being raised, fighting, and dying during this era, constant warfare became the norm and true peace seemed a dream. By the end of the Third War in 3025, any remaining vestiges of the Star League in the Inner Sphere were dust on the winds of history. By the end of the war, most nations were essentially being ruled by a modern version of the feudal system of government, with thrones inherited and passed down generation to generation. The latter days of the Third Succession War was the first setting in which players played BattleTech. In 3022, the Lyran Archon, Katrina Steiner, sent out a proposal for peace and alliance to the other Houses, who until then had been fighting on all fronts for essentially the entirety of their post-Star League history. Three of the Houses (Kurita, Liao, Marik) reacted suspiciously, but the First Prince of the Federated Suns, Hanse Davion, responded favorably and the two sides eventually agreed to an alliance. Within a few years, the terms had been set - Hanse would marry Katrina's daughter Melissa, and their two nations would merge into the Federated Commonwealth when one of Hanse and Melissa's children took the throne - until then, they would merely be allies. After this alliance was announced, ComStar brokered the Concord of Kapteyn, a shaky alliance between the three other Successor States. In 3028, all five Successor Lords met on Terra, for the first time since the fall of the Star League, at the marriage of Hanse and Melissa. However, they were in for a surprise. At the reception, while the bride and groom were exchanging gifts, Hanse gave his immortal line "My dear... I give you the Capellan Confederation! ", stupefying the head of the Confederation, Maximilian Liao, who was one of the Successor Lords present. Thus began the Fourth Succession War. FedSuns units began to systematically dismantle the Capellan Confederation, as Lyran forces and a few elite mercenary regiments held off the other two prongs of the Marik-Kurita-Liao alliance that had been formed in the wake of the announced Steiner-Davion marriage. However, ComStar, alarmed at the course of events, faked a FedSuns attack on one of its HPGs, and placed the FedSuns under Interdiction, cutting off all communications services. At this point, the attack began to falter, as long-range communications and attack coordination became nearly impossible, although the Capellans were still unable to force back the FedSuns. After a few more months of war, the two sides agreed to an uneasy truce, and the Interdiction was lifted. With the end of the Fourth Succession War a long stream of short but violent wars sprang up across the Inner Sphere due to public outcry, opportunistic leaders, and even the want of freedom from oppression. There would be no major fighting until the later invasion by the Clans. During this time period a momentous discovery had been made. The mercenary unit Gray Death Legion discovered a functional Star League-era memory core on the planet Helm in the Free Worlds League in 3028. The Grey Death Legion made the unheard of gesture of freely and openly giving a copy of the memory core to all the great houses instead of keeping it to themselves. This triggered a technological renaissance. After a few decades, Star League weaponry and systems started to become available again, and 'Mech technology eventually advanced back to near the point it had been three hundred years earlier. And it was just in time. The rediscovered technology gave the FedSuns-Lyran alliance, with their technological and numerical advantage, supremacy over the other Successor States. In the real world, FASA decided to skip ahead in the plot from 3030 to 3050 in order to allow for the technological renaissance to take hold. This allowed them to fulfill their goal of sparking an in-universe arms race that allowed them to introduce new equipment into the tabletop war game. Following the FWL Civil War, the Duchy of Andurien, in alliance with the Magistracy of Canopus, seceded from the Free Worlds League and proceeded to attack the "weakened" Capellan Confederation. Following several massive defeats, the war was reversed by a remarkable display of the will to survive, and the Capellans retook most of their fallen worlds. After this reversal, the Canopians pulled out and with the war the Duchy was fighting against the Free Worlds League taxing Duchy forces to their limit, the Confederation used their Warrior Houses to return the border to pre-war lines. The Free Worlds League underwent many changes as Captain-General Janos Marik and his heir Duggan were assassinated by their cousin Duncan Marik. Duncan prosecuted the war to reclaim Andurien somewhat successfully, but he alienated many members of Parliament in doing so. The dissatisfaction was manifested when Janos' son Thomas (who was presumed dead in the same blast that killed his father) reappeared and many MPs wanted to replace Duncan with him. Duncan died in an assault on a fortified Andurien position, which cleared the way for Thomas to take over. He used the shock of his reappearance and his relative popularity to get many laws passed that centralized power in the Captain-General in a way that it never had been before. Thomas was soon able to return the rebellious Duchy to League authority, though it would be decades before he allowed them to regain any autonomous authority. The Rasalhague Military District became home to a secession movement from the moment that the Rasalhague Principality was conquered by the Draconis Combine. The Lyran Commonwealth used this Mimir organization to its advantage during the Fourth Succession War, but failed in granting the Rasalhagians their independence. The Combine, under the leadership of Gunji-no-Kanrei (Deputy for Military Affairs) Theodore Kurita, granted the Rasalhagians their independence. This had three advantages for the Combine. First this would force the Lyrans into granting the Rasalhague worlds their independence that they had conquered, since it was that same promise that the Lyrans used to get the Rasalhagians on their side. Thus, they must give away all of their territorial gains of the Fourth Succession War. Secondly creating a peaceful buffer state with the nascent Federated Commonwealth that covered approximately three-quarters of the Combine border. Finally, because ComStar preferred weak and divided nations as they can be easily manipulated, ComStar provided aid. With the aid being given to the Combine in rebuilding their military from the Fourth Succession War, ComStar provided them with advanced technology, in the form of Star League Technology to aid them in future wars. Despite the myriad advantages, this move was seen as an unsatisfactory decision to many of the warriors of the Combine, including the warlord of the Combine's Rasalhague military district and a disaffected scion of the Kurita family. These warriors disobeyed orders and stayed in the newly created Free Rasalhague Republic to wage war against the former Combine planets almost immediately. The war got its name by the fact that the warriors disobeying the Coordinator were branded as ronin. The fighting was not just between the Combine, Rasalhague, and the ronin. Even the commonwealth had problems with a rogue baron wishing not to give planets of the Commonwealth to another nation. In the end this short but fierce fight was the birth of the FRR, just like the invasion of the Clans would be its death. This war also saw the new Rasalhagians nation forced to hire mercenaries to defend itself, since it had no armed forces of its own yet. The fledgling nation was unversed in contracting mercenaries, so many of the hired soldiers were able to use loopholes in their contracts to escape actual combat. This led to a negative sentiment toward mercenaries from Rasalhagians that ranged from mild contempt to undying hatred. The War of 3039 was the second war in which the LCAF and AFFS would ally. Delayed by bureaucracy and logistical problems, as well as the Skye Crisis, which allowed the Combine to prepare for the war. Many other factors also affected the war effort, such as the fact that the two nations had only a decade to work together and were not able to fully integrate yet. In addition, a cache of Star League-era 'Mechs was given to the DCMS by ComStar, and several elite regiments helped formed and trained by Wolf's Dragoons fought for the Combine forces. In the end, it was a feint by Theodore Kurita that led Hanse Davion to believe his military was stronger than it was that convinced Davion to cease his offensive. Unlike in the Fourth Succession War, the two nations had some time to integrate their commands, but since only having a decade and a single war where both sides had fought and won together with little interaction would not help the allies in the upcoming war. Though the war, originally planned to happen in less than a few years, turned into a decade as military planners realized that attacking the Draconis Combine would require deception on such an unmanageable scale to conceal troop movements. Unlike the Capellans the Combine leader was not as paranoid of who was planning their certain demise and realized that the recently formed Federated Commonwealth could be the only true threat in the Combine's future. Unbeknownst to ComStar and the Draconis Combine, during the Fourth Succession War a series of devices called Black Boxes, essential in defeating the communication interdiction against the Federated Commonwealth imposed by ComStar during the fourth war, were to be used by FedCom troops to coordinate troop movements but were not. This would have provided a tactical advantage to FedCom troops but was not utilized to their fullest potential as military strategists essentially ignored their usefulness and used the faster Hyperpulse Generators owned by ComStar. This allowed ComStar to warn the DC military to the threat. Unfortunately during the war several of these devices were captured by DC forces and used against FedCom troops. In August of 3049, the Inner Sphere began to hear of mysterious invaders using advanced technology, beyond that of even the Star League, in the reaches coreward of the Free Rasalhague Republic. Small periphery realms disappeared from contact and mercenary units were annihilated (including a detachment from the elite Kell Hounds). In March of 3050, the invaders struck at the Inner Sphere proper. The invaders, known as the Clans, cut a swathe through the Lyran half of the Federated Commonwealth and Draconis Combine and absolutely devastated the Free Rasalhague Republic. Using their technological superiority and impressive combat prowess, over a hundred planets fell in the first year. Four Clans rolled into the Inner Sphere that year. Clans Wolf, Jade Falcon, Smoke Jaguar, and Ghost Bear. While some counterattacks succeeded, they failed to stop their advance. It took the suicide attack of Kapten Tyra Miraborg, a pilot in the Free Rasalhague Republic's KungsArme, to do what entire regiments had failed: stop the Clan advance. Her suicide attack with her Shilone AeroSpace Fighter hit the bridge of the Clan flagship, killing ilKhan Leo Showers instantly. Under Clan law, a new ilKhan could only be selected on the Clan homeworld of Strana Mechty, which was almost a year's travel time from the location of the Clan forces in the Inner Sphere. So, for more than a year, the Clans halted their invasion as their individual leaders returned to their home planets to regroup and select a new ilKhan, and then returned to continue with the invasion. This allowed the nations of the Inner Sphere some much-needed time to recuperate and plan for the expected resumption of the invasion, and it was time that they used to great effect. Aside from ending their conflicts and uniting against the threat, they also gained valuable insights into the nature of the Clans. The leader of Wolf's Dragoons revealed that his mercenary unit was, in fact, a reconnaissance mission sent by the Clan leaders, and explained the history of the Clans to the leaders of the Inner Sphere. On the Dragoons' homeworld of Outreach, the leaders of the Inner Sphere (and their heirs) trained to work together against the Clan threat. When the invasion finally resumed under former Wolf Khan Ulric Kerensky, the forces of the Inner Sphere were much better prepared to combat them. Ulric activated two reserve Clans, the Steel Vipers and Nova Cats, though this was as much to cause strife within the Clan Occupation Zones as it was to aid the invasion by pairing them up with hated rivals, the Jade Falcons and the Smoke Jaguars. The spirit of cooperation that had been forged on Outreach bore fruit when Prince Hanse Davion sent Wolf's Dragoons and the Kell Hounds to the Combine's capital, Luthien, upon hearing of an imminent Clan assault upon the system. With the help of the FedCom mercenaries, the Combine was able to repulse the joint Jaguar-Nova Cat assault. Despite the limited victories the Inner Sphere forces were able to win, however, the true turning point in the war came when ComStar learned of the Clans' goal: Terra. Terra, the cradle of civilization and only holding of ComStar, was the goal of each of the Clans. Whichever Clan captured Terra would become the ilClan, the supreme Clan. Until then, ComStar had been covertly aiding the Clans through their Precentor Martial, Anastasius Focht. It was only when Primus Myndo Waterly met with the ilKhan that she discovered their intentions. Since neither side wanted to damage the birthplace of humanity, they agreed to fight a proxy battle on the Rasalhagian world of Tukayyid. If the Clans won, then ComStar would grant them Terra and become the Clans' administrative arm in the Inner Sphere. If ComStar won, then no Clan could advance beyond Tukayyid for fifteen years. For the battle, Ulric activated the third reserve, Clan Diamond Shark. Focht threw almost the entirety of the ComGuard at the Clans on Tukayyid. ComStar acted as the defender in the battle, and each Clan had to conquer two cities from the ComGuard forces to be successful. The battle started on May 1, 3052. Focht exploited a weakness in Clan strategy. The Clans favored quick battles between small forces, so the ComGuard dug in for a protracted campaign. At the same time, Primus Waterly initiated Operation Scorpion, which depended upon a complete, Sphere-wide communications blackout to force all the Inner Sphere leaders to bow to ComStar. Ultimately, Clan Wolf was the only clan to complete their objectives, though the Ghost Bears and Jade Falcons managed to take one of their objectives, forcing a draw. The Falcons reached a draw because their destruction of many ComGuard units by the Falcon Guards, the Ghost Bears by their taking of one of their objectives. Which meant that the ComGuard was victorious, though at a stupendous cost. Once the battle ended five days later and Focht learned of Waterly's duplicity, Focht assassinated her and placed a known (to him) Combine spy in her place. Thus, the Clan Invasion ended. 3052 saw other upheavals as Chancellor Romano Liao assassinated Justin Allard and then was in turn assassinated by his wife, her own sister, Candace, and Prince Hanse Davion died of a heart attack upon learning of the betrothal of Romano's heir Sun-Tzu to Thomas Marik's illegitimate daughter, Isis. Within ComStar, Focht and Primus Sharilar Mori's efforts to reform ComStar of its pseudo-religious trappings led to a backlash from Precentor Atreus Demona Aziz. Aziz led a splinter faction to the Free Worlds League known as the Word of Blake and received protection for Thomas Marik, who had been a member of the Order. In 3055, Archon Melissa Steiner was assassinated by her daughter, though the blame was laid at the feet of her son Victor, who succeeded her and officially inaugurated the Federated Commonwealth as its first Archon-Prince. On Outreach in 3052, Prince Hanse Davion had convinced Thomas Marik to retool his factories to provide refit kits with Star League-era technology for sale to the Federated Commonwealth and Draconis Combine. Marik initially refused, but had to relent when Davion offered Marik's son Joshua, who suffered from leukemia, a chance to recover with the help of treatment at the New Avalon Institute of Science. Hanse had also prepared a plan to institute a double for the boy and, thus, place a pawn in the succession of the Free Worlds League. Hanse died, but the plan lived on. When Joshua died of his leukemia in 3057, Archon-Prince Victor instituted the plan, though he simply wanted the refit packages to continue coming, and he apparently had no intention of having the double become Captain-General. A Capellan spy learned of the deception, and Chancellor Sun-Tzu Liao told Thomas Marik. The duo then launched Operation Guerrero, whose objective was to reclaim the worlds lost to the Federated Commonwealth in the Fourth Succession War. The invasion succeeded beyond their wildest dreams. Because of the poor handling of an abortive succession by the Isle of Skye from the Commonwealth, Victor's popularity was extremely low in the Lyran half of the nation. In fact, it was so bad Victor retreated to the former Suns capital of New Avalon and left his sister Katherine as his regent on the Lyran capital of Tharkad. The power-hungry Katherine used her brother's duplicity and the invasion as a pretext to enact Emergency War Powers and secede the Lyran half of the realm from the Federated Commonwealth. She was soon thereafter ratified as Archon by the Estates General. She gave Thomas Marik all the worlds the Free Worlds League had lost during the Fourth Succession War and called for all traditionally Lyran units to retreat to the pre-4th War border. Thus, most of the units defending the Sarna March returned to the newly-christened Lyran Alliance. This action used many of the JumpShips alloted to the region, so Archon-Prince Victor was unable to reinforce the worlds the Lyrans vacated. Because the Free Worlds League thus achieved its objective, Thomas Marik pulled his forces out of the invasion, though he did allow the Capellan Confederation to purchase the contracts of many mercenary units. Sun-Tzu had activated guerrillas on many of the worlds the Commonwealth had conquered from his realm, but he lacked the military force to pacify those worlds because of the League's pullout. The Lyrans had retreated and the FedCom was unable to move troops to the region because it lacked the transport capacity, so the Sarna March became a no-man's land that was dubbed the Chaos March. In this vacuum, many local leaders formed minor states, though just as many worlds were plagued by internecine fighting between groups that supported various factions. In some places, Draconis Combine troops were inserted under the auspices of peacekeepers, even further confusing the situation. To add insult to injury, Word of Blake conquered Terra from ComStar in 3058, and the two factions fought running battles between each other for control of the HPGs on various Chaos March worlds. In 3057, the Crusader faction of the Clans gained enough clout to bring trumped-up charges of genocide against ilKhan Ulric Kerensky. The Grand Council stripped Ulric of his title, but, as was his right, Ulric declared a Trial of Refusal. While most expected him to defend his actions personally, he instead instigated a war between Clan Jade Falcon and Clan Wolf. Ulric knew that the other Clans wanted to renew the invasion, so he planned to severely weaken the strongest Crusader Clan to the point that it would not be able to break the Truce of Tukayyid. His plan was successful, although he died in the last fight through the duplicity of Falcon saKhan Vandervahn Chistu, who violated Clan honor by using himself as bait for an ambush. Hence Ulric was found guilty (though the point was moot). Vandervahn Chistu's actions, however, were to have later implications on his attempt to absorb Clan Wolf and the leadership of Clan Jade Falcon. Upon the defeat of Clan Wolf, Elias Crichell, Khan of Jade Falcon was elected ilKhan of the Grand Council. The Falcons attempted to absorb the remaining Wolves, who were guilty by association along with Ulric. A core of Clan Wolf still retained its independence however, in the form of Clan Wolf-in-Exile. At the very beginning of the Trial of Refusal, Ulric had sent the strongest contingent of Wolves under the command of then-saKhan Phelan Ward to the Lyran Alliance to help defend against the Falcons in case his plan did fail. Following Ulric's death, these Wolves became Clan Wolf-in-Exile. An effort to destroy the exiles was immediately attempted by the Falcons, but Phelan and his Wolves defeated them with the help of the Kell Hounds mercenary regiment, weakening Jade Falcon to the point that any further military action on their part might neuter their forces entirely. Although the Wolves had technically lost the Trial, Ulric's plan was a success, despite his death. The war between the two Clans was so brutal and damaging that it came close to crippling the Falcons' military, so they absorbed the remnants of Clan Wolf. Initially, nobody opposed this until Vlad was rescued from his downed 'Mech. He was present at the fight between Ulric and Vandervahn, had witnessed the death of Ulric as well as other 'Mechs carrying long-range missiles, so he knew the truth of the matter. Vlad declared a Trial of Refusal against the absorption. He won this fight and killed Chistu in single combat. Since all of Clan Wolf, by virtue of having defended Ulric, was guilty of genocide, Falcon Khan Elias Crichell split off the Wolves as Clan Jade Wolf. Vlad was incensed by this name, but bided his time. He quickly thereafter earned his bloodname and was elected Khan Vladimir Ward. Under Ward's able leadership, his Clan slowly built its strength again. Before this was done though, Vlad showed that he had learned Clan politics well. Through the use of political manipulation, he initiated a challenge that Elias Crichell simply could not refuse: he called into question Crichell's status as a warrior. The aging Elias Crichell was no match for Vladimir who was in his prime, and Vlad killed him in a one-sided, hand-to-hand battle on the floor of the Grand Council. This gave him the political clout he needed to rename his Clan "Clan Wolf," though he made it clear that this was a new Clan and not the same Clan Wolf that fought next to ilKhan Ulric. With the revenge against those responsible for the near destruction of Clan Wolf and the treacherous murderer of Ulric Kerensky dead, Vlad turned his attention to rebuilding Clan Wolf. Wolf-in-Exile however, remained in the Inner Sphere, retaining their independence, and following the wishes of their deceased Khan Ulric. The result was that two forms of Clan Wolf now existed independently of each other, the Exiles retaining the original spirit of the Clan and defending the Inner Sphere, and Vlad's Crusader Wolves preparing to invade it. In 3058, Clan Jade Falcon launched an invasion of the Lyran Alliance that was eventually beaten back by a multi-national force under the command of Archon-Prince Victor Steiner-Davion. The cooperation fostered during the Battle of Coventry led the Inner Sphere leaders to complete the Clans' objective for them and resurrect the Star League. The Star League was composed of the Federated Commonwealth, Draconis Combine, Free Rasalhague Republic, Lyran Alliance, Free Worlds League, Capellan Confederation, and St. Ives Compact; with ComStar serving as a non-voting member. While the Star League Defense Force would take time to build up, some of the military forces of the member-states rotated into service under the Star League banner, and they took part in many conflicts. In order to provide legitimacy to the New Star League, the Council decided to launch an invasion against the Clans and to utterly destroy one of them. They chose Clan Smoke Jaguar, partly because a defector gave them the path to the Jaguars' capital world of Huntress but also as retribution for the many atrocities inflicted upon the Inner Sphere by Clan Smoke Jaguar. Led by Anastasius Focht and Victor Steiner-Davion, Operation Bulldog was the first half of the Star League's invasion. The SLDF forces, which included members of Clan Wolf-in-Exile as well as every member-state and many mercenaries, were startlingly successful in their assault. Unbeknownst to them, other Clans were maneuvering against the Smoke Jaguars, so no help was forthcoming. In addition, the Jaguars were gearing up for a new offensive, so they were caught off-guard by a full-scale invasion. In a war that seemed too easy, the Jaguars were forced out of the Inner Sphere, sending shattered units home to Clan space. SLDF units under the command of FedCom Marshal of the Armies Morgan Hasek-Davion moved in secret to the Smoke Jaguar capital of Huntress. Though Hasek-Davion was assassinated before the force reached Huntress, the Eridani Light Horse's General Ariana Winston was able to take Huntress. Then the remnants of the Smoke Jaguars' Inner Sphere force returned home. The Jaguars fought a fierce battle to retake their homeworld, but the Inner Sphere forces were saved by a task force composed of some of the most elite units the Inner Sphere had to offer under the command of Prince Victor. Victor then led his force to Strana Mechty, the Clan capital. There, he initiated a Trial of Refusal against the Clan Invasion. Despite the questionable legality of such a challenge, the Clans accepted and the Crusader Clans fought against Victor's force. The Star League task force was successful, and the Clan Invasion was over. Despite this, Wolf Khan Vlad Ward abstained in the voting to accept Victor's challenge, so he claimed that the Trial's results did not apply to the Wolves. Victor led his forces against the last remaining remnant of the Smoke Jaguars, including ilKhan Lincoln Osis, and defeated them, thus completing the annihilation of the Clan. The St. Ives Commonality had split from the Capellan Confederation with the aid of the FedSuns after the Fourth Succession War and formed the St. Ives Compact. Following his election as First Lord, Sun-Tzu Liao used his position to order SLDF troops into action to aid his House troops in the reintegration of the wayward state back into his nation by 3061. When Prince Victor returned from Clan space, he found that Archon Katherine (who preferred to be known as Katrina) had usurped the regency of their younger sister, Yvonne Steiner-Davion. Though he was initially against fighting her, Victor was compelled to take control of a rebellion that was going forward with or without him when Arthur Steiner-Davion was apparently assassinated. The war had three sides: the forces loyal to Katherine (Loyalists), the men and women who followed Victor (Allies), and the neutral citizens that saw neither side as being better or preferred to latch on to regional loyalties. Soon, there were only two sides as Katherine saw all those who did not support her as the enemy. The war touched every Successor State in some way. The Lyran Alliance and Federated Commonwealth bore the brunt of the devastation as units from both sides attempted to crush the other. Forces from the Federated Commonwealth's Draconis March attacked the Draconis Combine, and then suffered under their counterattack. Thomas Marik's sister Kristen, who was the commander of the mercenary Kristen's Krushers, was killed during the war when overzealous Lyran commanders attacked the neutral unit. When her half-brother Thomas did nothing to save her, her brother-in-law Marshall Jeremy Brett of Tamarind attacked the Lyran world of Arcadia, though it failed to save any Marik who was serving with the unit and Thomas gave it back at the end of the war. The Capellans loaned Victor's best friend Kai Allard-Liao and some of his 1st St. Ives Lancers to the Allied forces during the war, though a Capellan Warrior House conquered the important industrial world of Tikonov from the Federated Suns as the war ground down. With forces fighting from one end of the sundered Federated Commonwealth to the other, and mercenaries in between, navigating the military and political waters presented several challenges. Eventually, the war ended with the Allies successful and Katherine was sent into exile among Clan Wolf. Victor returned to ComStar as Precentor Martial, and named his brother Peter as Lyran Archon and his sister Yvonne as Prince-Regent for her then-unconceived child. In the real world, FASA announced that it was shutting down during the FedCom Civil War storyline. They finished the line and WizKids announced that they had purchased the BattleTech intellectual property. They then announced that they would be jumping the timeline 60 years into the future to launch MechWarrior: Dark Age. They believed that this move would give them the opportunity to attract new players without forcing them to read over a dozen novels for them to be able to understand the events that were taking place. They then licensed part of BattleTech to Fantasy Productions (FanPro), a Germany-based company which has licensed the ability to publish products for the original tabletop wargame and publish sourcebooks (but not novels) set before 3130. They rebranded their products as Classic BattleTech in order to differentiate it from both the original FASA material and from WizKids' products. InMediaRes has since licensed the ability to publish new fiction set in the Classic BattleTech timeline on BattleCorps.com. In January 2007, they also published their first print anthology. At the Whitting Conference of 3064, the Free Worlds League nominated Word of Blake for membership in the Star League. A radical sect of Blakists known as the Sixth of June believed that this was their path to power. Their hopes were dashed, however, when the 3067 conference resulted in the collapse of the Star League as the Capellan Confederation, Lyran Alliance, and Federated Suns all removed their support. The angry Blakists' attempt to force the recalcitrant nations back into the League resulted in a war that engulfed every major faction. The Jihad represented a return to total war in a way that even the FedCom Civil War did not match as the Word used orbital bombardments and nuclear and biological weapons, and wantonly attacked civilian targets. They were able to corral most leaders on their capitals, forcing regional leaders to take a more active role. They also disabled the HPG network, further complicating the attempts of sovereigns to control their countries. In addition, they were able to foster wars between many neighboring states by manipulating these regional leaders. The most stunning success was in the Free Worlds League, where the nation actually broke into its constituent parts. The Jihad wreaked untold havoc on the Inner Sphere as military units were smashed, factories annihilated, people slaughtered, and whole planets wiped out. This apocalyptic war was finally stopped in 3081 when Devlin Stone led a coalition of forces to victory over the Blakists on Terra. Stone used the exhaustion the Jihad caused to convince the war-weary Successor States to allow him to create his own nation around Terra. The Republic of the Sphere was founded in 3081 and Stone took over many of the most hotly contested worlds in an attempt to let peace have a chance. This peace was a mere illusion, however, as the Capellan Crusades against the Republic proved in the 3090s. A few other small conflicts took place. The Federated Suns played a prominent role in some of these, including seizing the Capellan commonality capital of Victoria and creating a buffer state between the Draconis March and the Draconis Combine. These events provided the filler for the events between the end of the FASA story and the beginning of WizKids'. As such, information is sketchy on purpose so as not to steal too much of FanPro's thunder. In the early 3130s, attacks perpetrated by an unknown agent or agents disabled the HPG network. Theories as to who did this abound, but there are no confirmations. This event caused long-buried hatred to flare up as everybody pointed fingers. This reached a fever pitch in the Republic of the Sphere as old hostilities came back to the fore, and many people and leaders began to identify with their old nations. Over half a dozen factions popped up, proclaiming a desire to have a Clan or neighboring nation rule them instead. Some nations, like the Draconis Combine and Capellan Confederation and even Clan Jade Falcon did try to take advantage of the chaos, while the Federated Suns instead chose to ally with the Republic. This situation was complicated for the Republic when they were faced with information of a plot led by its Senate against the military government. This civil war flared up at an inopportune moment as many Inner Sphere leaders were on Terra, though the FedSuns alliance helped the Exarch defeat the Senate loyalists on Terra. With the Republic being carved up by a Senate Alliance and foreign powers, newly-elected Exarch Jonah Levin announced Fortress Republic. He withdrew most Republic forces to within the boundaries of Prefecture X, the interior region. He declared that this border was to remain inviolate and that the Republic would use everything at its disposal to keep it as such. In the meantime, other forces remained outside of the Fortress to try and keep Republican worlds and citizens safe for the eventual return of the Republic proper. Over the course of fifteen years, from 2556 to 2571, Cameron managed to sign deals with the other five Houses to establish an organization known as the Star League. Headed by House Cameron, though with the other five Houses given a place on the ruling Council, the organization promised an end to inter-House war (as well as some massive incentives to sign on to the deal, ranging from military support to technological aid). However, Cameron was as much power-hungry as visionary, and he was therefore not content to be the universally accepted leader of the bulk of humanity. When the Star League had finally been assembled in 2571, among his first actions was attempting to get the lesser nations of the Periphery into the Star League. When requests and negotiation failed, he moved to trade sanctions, and when those failed, the Reunification War began. Thought by the Star League powers to be a war that would cost little, it actually took over twenty years to pacify the last of the Periphery holdouts, as well as unthinkably large losses to the Star League Defense Forces and the various House armies and navies. However, the Star League was by far the more powerful of the sides, and their victory was probably inevitable, despite the heavy losses they suffered to win. When the Taurian Concordat's last bastion of defense (a heavily mined nebula that wreaked havoc on SLDF navies for years) finally fell in 2596, the Reunification War was over and Ian Cameron had achieved his dream of reuniting the whole of humanity under one banner, as it had been united during the early days of the Terran Alliance. During the nearly two hundred years that the Star League endured and relative peace reigned, technology bloomed. 'Mech and WarShip technology continued to advance at a rapid pace, and the first Hyperpulse Generator (HPG) went online in 2630, providing humans a way to communicate between planets without the need for moving JumpShips to transmit messages. The golden era of the Star League would, however, come to an end in a way few expected. In 2767, following a series of rebellions in the Periphery that drew the bulk of the SLDF forces away from the central areas of the Star League, Stefan Amaris of the Rim Worlds Republic, supposed friend of First Lord Richard Cameron, assassinated the entire Cameron family and proclaimed himself new First Lord. The SLDF, under the command of Aleksandr Kerensky, regrouped quickly, drove inwards, and liberated the entire Inner Sphere from Amaris' clutches in a long and bloody 13-year war, culminating in the conquest of Terra. However, the SLDF, having been massively depleted in this war, no longer had the strength to hold the fractious Houses together, and eventually abandoned the Inner Sphere entirely in the great Exodus of the entire SLDF to the deep Periphery, not to be heard from again for three hundred years. ComStar is the successor to the Star League's Ministry of Communications, and runs all of the Inner Sphere's HPGs, maintaining essential communications between every pair of star systems. Formed by Jerome Blake, the last Minister of Communications, after the fall of the Star League, ComStar has slowly morphed into an organization as much religious as practical, believing in everything from the need to pray to the machines they run to an eventual apocalypse that would engulf the Inner Sphere even more thoroughly than the fall of the Star League and the ensuing Succession Wars. Early in the First War, ComStar occupied Terra and has preserved it as both neutral ground and headquarters since. As well as their obvious communications duties, ComStar is also the Inner Sphere's most important bank and money-mover, runs the Explorer Corps to catalog the deep periphery, runs the Mercenary Review and Bonding Commission, and keeps a massive force of over seventy regiments of Star League-era 'Mechs, the Com Guards, and the only fleet of space going WarShips hidden in case of a future crisis. After the fall of the Star League and the Exodus of the SLDF, the five great houses' respective leaders claimed to lead the Star League, with no formal directive of succession as the Cameron family was unable to produce an heir. This caused the houses to wage war to see who would be the heir to the throne. With most of the Star League forces gone what was left was forces loyal to the houses that they were either formed at, stationed, or even the case in a rare circumstances still believed in the ways of the Star League, still flying the banner of the Star League, only dealing with the houses as a nicety to survive. The outcast, the unwanted, the rebellious; the Periphery consists of the most rag-tag group of people ever to exist. Most Periphery States have a low level of technology, with only the largest approaching the early 30th century tech base. While Kerensky's warriors may not have been heard from in the Inner Sphere, they certainly continued to exist. Though the year-long Exodus and a number of internal rebellions took their toll, remnants of the SLDF survived, and began to thrive seven hundred light-years from the Inner Sphere. After Aleksandr Kerensky died in 2801, leadership fell to his son Nicholas, who began to reforge the SLDF into the Clans. Nicholas split his last loyal cadre of warriors into twenty Clans, each named after an animal thought to embody an important trait to a warrior. Leading the Clans to victory over another rebellion, Kerensky established the rule of the Clans. After Annihilating one of the Clans for daring to rebel against him and claim freedom from Clan structure, the new order established itself effectively. Warriors were valued over civilians, genetically-engineered warriors were valued over their naturally born counterparts (truebirths and freebirths, respectively), and honor and military prowess were valued above all else. The system may not have been ideal, but it allowed survival in the face of hostile environments, and gave rise to an astonishing amount of military potential. For two hundred years, the Clans were content to develop and fight on their own, independent from any other humans. During this time they developed everything from powered battle armor to genetics programs and artificial wombs for their trueborn warriors, to incredibly advanced military technology, far beyond that possessed by humans even in the heyday of the Star League. However, one issue began to bubble to the surface by the end of the 30th century, and that issue changed the history of the Clans and the Inner Sphere forever thereafter. It all started with a message Aleksandr Kerensky had sent out to the Exodus fleet after the first rebellion, telling the SLDF remnants that it was their duty to endure and to one day return to the Inner Sphere. The Clans split two ways on the issue - there were the Crusaders, who believed it was their duty to reconquer the Inner Sphere and re-establish the Star League that had fallen centuries ago, and there were the Wardens, who believed that it had been more of an inspirational ideal than a literal order, and that if they were to return one day it would be to protect humans from an outside threat, not to conquer them all. At the beginning of the debate, the Wardens were dominant, but by about 3000, the Crusader faction began to dominate. Desperate to stave off invading, the Warden-minded Clan Wolf pushed for a compromise - they would send an old group of Star League 'Mechs to scout the Inner Sphere by disguising themselves as a mercenary group. The so-called Dragoon Compromise (the group's name was the Wolf's Dragoons) worked well for a time, though eventually reports from the Dragoons started to dry up mysteriously. Though no one knew it at the time, the leader of Clan Wolf had ordered the Dragoons to prepare the Inner Sphere for the coming invasion, and prepare they did. Bills, Randall N.; et al. (2007). "A Brief History of the Inner Sphere", Inner Sphere at a Glance, Classic BattleTech. Lake Stevens, WA: Catalyst Game Labs (inMediaRes Productions). ISBN 978-0-9792047-3-9. Hartford, Chris; et al. (1993). "History of Naval Warfare", in Donna Ippolito: Battlespace Sourcebook. Chicago: FASA Corporation. ISBN 1-55560-208-8. Nystul, Mike; Lester W. Smith (1991) "Historical Overview", in Donna Ippolito: MechWarrior, Second Edition, Chicago: FASA Corporation. ISBN 1-55560-129-4. ↑ "Historical: War of 3039"
The text in this article is based on this revision of the Wikipedia article "410771253" used under the terms of the GNU Free Documentation License. See the BattleTechWiki's copyright notice. This page was last edited on 2 May 2018, at 00:30.